HomeAll postsGeneralHow to lay out a lesson? How to lay out a lesson? 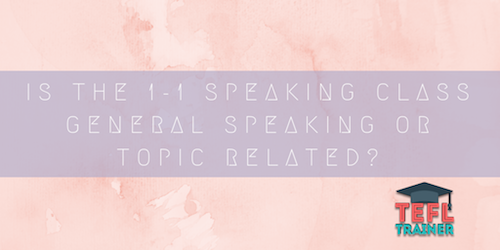 Is the 1-1 speaking class general speaking or topic related and if so, what activities/material are done in the speaking classes? For many TEFL trainer teachers, a lesson does not only incorporate the time we spent delivering certain activities to our student. It also involves the time spent planning the session all together, and allocating it into several stages that will help you effectively lead your students in the right direction. Personally, I believe that the most important object in the classroom is encouraging motivation in your students. It is vital because if not there will be no conversation and the student will be shy. It also gives both you and the student the chance to recognize what area they need to improve. Every class has a different topic to talk about whether it is teaching general English classes or exam related classes. After the warm-up time which is the first 5-10 minutes, every lesson should be divided in different kinds of activities which will keep your students interested and attentive. Start off by asking the student to read the article they have just listened to as this give you the opportunity to listen to their pronunciation and afterwards you can use this method to create an activity to enable the student to remember these particular words they struggle to pronounce. Then I would form questions to ask the student about the text they have listened to and read about. The student should find this straight forward as they have had a little understanding of this text. By doing these different activities with the student, and checking their work during that progress, you can assess to see if they understand what you have already presented. After this exercise, I would suggest doing a little bit of grammar. For example, pick some idioms and phrasal verbs from the text and ask the student to explain these to you. I have personally had some students that even after looking these up in the dictionary they still struggle to give me an explanation. Furthermore, you should then have a sheet with a few pictures related to the topic and ask the student to describe these picture, talk about the pros and cons or ask the student to try and make these personal experiences. This activity gives the student the chance to develop their answers, and use as much vocab and even the idioms from the class. You want to try and develop a creative summary of the topic to check the students understanding to it. I always try and use a variety of activities to keep the student motivated and demonstrate their level and knowledge of the English language. Taking everything into account, even if you have planned your lesson sometimes it will not go to plan. Having said this, I would always have extra materials ready just in case you find yourself in a challenging situation as the speaking classes should be taught by using different materials and activities to keep the student engaged in the lesson. If you feel that your student likes some activities more than others, plan the lessons with the materials your student prefers. Finally, it is always a good idea to round up the lesson by recommending some additional activities related to the target language, because the student should be aware that language learning doesn’t have to only happen in the academy but they need to do extra work in their free time also.